Today we had a very long coach journey to PGL...but it was worth it. Just look at the view when we arrived. All this travelling builds up an appetite! Today was extremely busy. Some of us got up at 6:30 to watch the sunrise. After breakfast we took part in abseiling, fencing, Jacob's Ladder and archery. Up at 6:30 to watch the sunrise...thanks Year 6! GB Fencing Team for 2020 Olympics. All because the lady loves Milktray. Day three and we haven't slowed down yet! 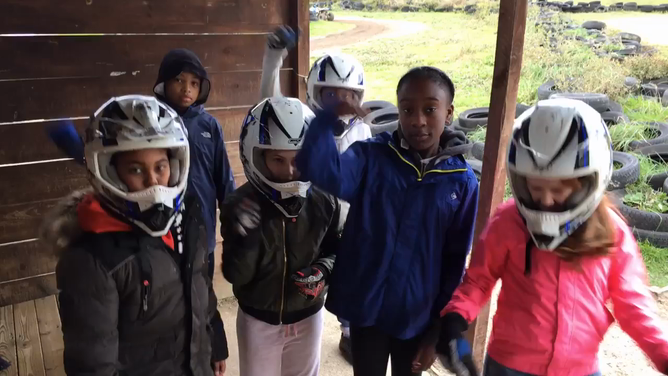 Today we took part in quad biking, indoor climbing, problem solving, survivor and we even managed to squeeze in a game of volleyball while the sun was shining. Day four and we're still taking on new challenges. Today we've been taking part in aeroball, the giant swing, zip wire and a beach walk. Our last day at PGL and we had two activities to complete before heading home. We learned some very important life saving skills in Heart Start and then flung ourselves off a very tall telegraph pole when taking part in Trapeze! We've had an amazing time, but are really looking forward to seeing our families again! Performing some life saving skills. Having a chat under the gazebo, like you do! Miss Bird making it look easy.